Robi/Airtel 1Package 2SIMs with matching last 6 digits Number! The Robi and Airtel bring a Great Offer name Airtel/Robi Free SIM with matching last 6 digits Number. If any customers buy a Robi New SIM or Airtel New SIM, he/she get a Free Airtel SIM or Free Robi SIM with matching last 6 digits Number. Are you looking Airtel/Robi Free SIM Offer with last 6 digits matching number details information? If yes, just follow the below. 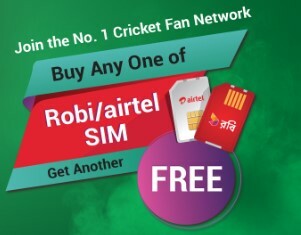 1 package 2 SIMs (Robi or Airtel) with matching last 6 digit number. Enjoy 0.5Paisa per second call rate between the two numbers. The Special call rate will be effective for 60 days after which default super FnF tariff will be applicable. If customers migrate out of the new SIM package, the special tariff will not be applicable anymore. Both Robi and Airtel SIMs have to be registered on the same day under the same NID. VAT + SD + SC on tariff will be applicable. Thanks for staying with us a long time and visiting Robi/Airtel 1Package 2SIMs with matching last 6 digits Number article. If you have any confusion or question about the Airtel/Robi Free SIM Offer 2017, just comment here. We reply as soon as possible with a correct answer.